This cursive handwriting practice workbook is for teens in the following ways: The phrases and sentences are written for a teenage audience.The font size is smaller than workbooks designed for kids.The blank lines are narrower than workbooks designed for kids.Most pages aren't designed to be traced prior to copying.There is just a quick refresher of basic letter and words practice.A challenge chapter includes visual exercises.The last chapter includes writing prompts.For teens who need more basic handwriting practice (which is common, since cursive handwriting is disappearing from many schools' curricula), Julie Harper also has a more basic cursive handwriting workbook for teens: ""Cursive Handwriting Practice Workbook for Teens"" (ISBN 1492230235).Teens enjoy writing sentences like, ""Set your alarm to play your favorite song,"" and, ""Dancing is contagious. Catch it and have fun."" Exercises like these help to make learning fun, even at home. 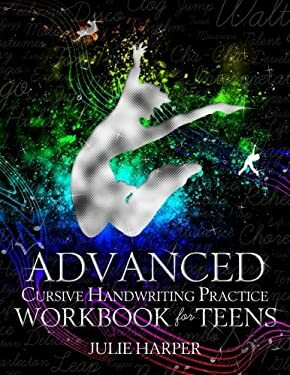 This unique teenage handwriting workbook provides teens who need to improve their cursive writing fluency a chance to do it with a more age appropriate workbook.This workbook focuses on writing phrases and sentences in cursive in seven parts: Quick letter reviewLetter blends (like ""br"" or ""wh"")Copy sentencesCopy paragraphsVisual challengeRewrite print in cursive (includes answer key)Creative writing promptsMay your students or teenagers improve their handwriting skills and enjoy reading and writing these phrases and sentences.